Growing up I ate a lot of beets. But I never ate fresh roasted beets. I always ate the can ones; not that there is anything wrong with eating canned beets I was just never introduced to the fresh ones as a child. *Just want to make that clear since my mom reads and I’m sure I’ll catch hell for it later. It wasn’t until earlier this year I started experimenting in the kitchen with fresh beets. Last week, while shopping at my local produce market I decided to give them another try and challenge myself to cook with them. I scoured the internet for recipes and found this recipe from good ‘ol Martha. I also found a recipe for beet greens… yes, as in the greens that are attached to the top of the beets. I tried both, and loved both recipes; however, did not photograph the beet greens so that will be a later blog post! Ultimately, I wanted a refreshing summer salad that was light and super healthy. This recipe did just that. Served chilled with bold colors and flavors Since I love basil and cook with it just about in every meal I decided to add the aromatic herb to the dish. It complemented all the flavors wonderfully. If you are looking for a flavorful summer salad to serve… this is the recipe for you. Preheat oven to 425 degrees. Chop the tops of the beats off (save the greens for another meal), scrub the beats, and then place beets on a large piece of foil on a baking sheet. Top with 1 tablespoon of extra virgin olive oil. Fold foil around the beets and crimp ends to form a packet. Roast beets in oven until tender (when pierced with a knife: about 45 minutes). Remove beets from foil and let cool preferably in the refrigerator. Once the beets are cooled they are very easy to peel. Once the beets are peeled cut into 1/4-inch-thick slices. In a small bowl, whisk together remaining 3 teaspoons olive oil, thinly sliced shallot, lemon juice, and lemon zest and red wine vinegar; season with salt and pepper to taste. On a large platter or on individual plates, arrange beets and tomatoes (every other one being a beet) add 3 artichoke hearts per plate. Drizzle with dressing and sprinkle with thinly sliced basil leaves. *You can refrigerate this salad up to 2 days; however, note that your tomatoes will become stained from the beet dye. My husband won’t even TRY beets because he was so traumatized by the canned ones. I’ve tried explaining that there’s no comparison but he’s not buying it. Oh well, when I make this yummy salad I’ll have all the delicious beets to myself! Awe that’s horrible. I loved canned beets growing up, so its taken me a little bit of time to get use to the fresh ones. Hopefully, you will one day be able to convince him to give the fresh ones a try! I love beets and I know there are so many people who just hate them. I love the earthy flavor and with the right vinaigrette…heaven. Love this, Katie!! I love beets…even when I was a kid and like Kristy’s hubby, Curtis won’t eat them either! Thanks Julie. Jon is not a fan either. 🙁 o-well more beats for me! When I first clicked through to this post I could have sworn it said “beef, tomato, and artichoke” salad. While I’m a a beef lover, beets make this sound sooo much more appetizing! Yum! lol that is too funny, Rachel! 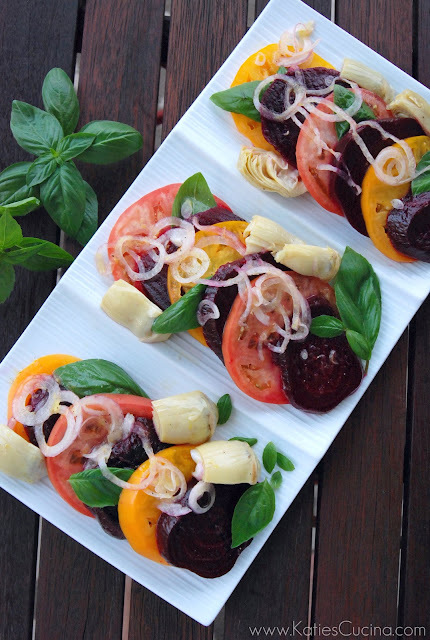 I LOVE all of the above: beets, ‘chokes, tomatoes – great pairing and pretty pictures!! Oh Katie, what a beautiful salad! I love beets. Thanks Aggie! It looks as good as it tasted!